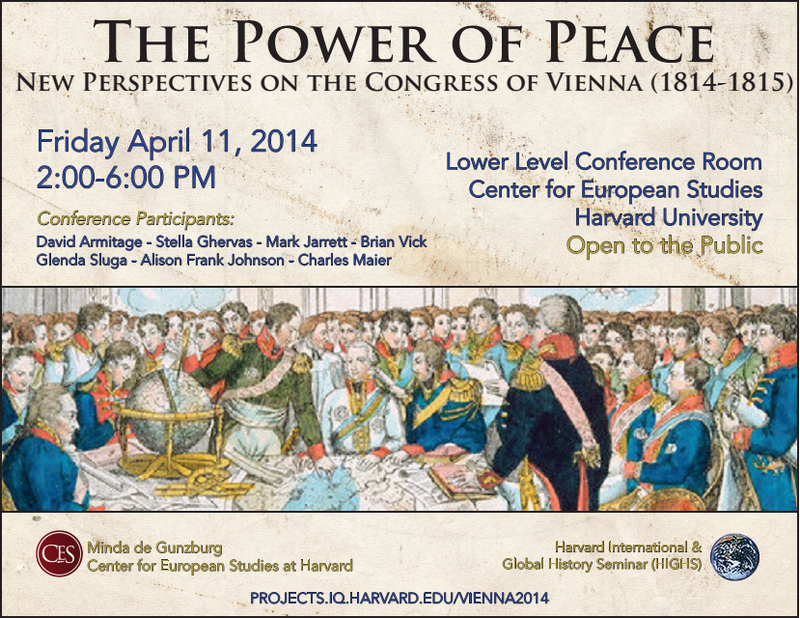 Harvard University will be hosting an international conference – The Power of Peace: New Perspectives on the Congress of Vienna (1814-1815) – April 11, 2014. “2014-15 will mark the bicentenary of the Congress of Vienna, a significant step in the transition from the Ancien Régime to a new international order in which peace was largely maintained through diplomatic dialogue. This post-Napoleonic period has previously been the subject of major works by scholars of international relations and comparative politics (notably the classic studies of Henry Kissinger and Paul Schroeder). Yet many national histories still portray the Congress as a mere “reaction” by conservative monarchs, heralding a time of political and social regression. More recent works, written from a transnational and even a global perspective, have done much to revise these traditional views. They have also expanded the range of approaches to include cultural history, intellectual history, the history of gender and the history of slavery. The resulting picture has become far more complex and nuanced, bringing new themes and issues to the fore. The abstracts for the conference can be found here. If I were on the eastern seaboard, I would be there. When I was coming of age, high school history books still treated the Congress of Vienna as a reactionary attempt to rollback the French Revolution. I was stunned at university to learn that there were other perspectives. Prince Clement von Metternich has long since been rehabilitated in my mind (thank you Henry Kissinger), and I enjoy discussing the Congress System with my survey classes. From the abstracts for the conference, it seems that there is new material for me to add. A 1988 graduate of the University of Michigan, I have taught history at Miami University since 1992. I maintain blogs on teaching Western Civilization and on Great War. My research focuses on anti-Semitism and rural politics in northwest Germany. I am completing a monograph for Bloomsbury Press, Anti-Semitism and Rural Politics. You can follow my project at http://peasantsandjews.org. Along with Mark Sadler, I have published a book of primary documents on the Stab-in-the-Back Myth (Dolchstoßlegende). http://www.dolchstosslegende.com. I also invite you to visit my profession web page at http://georgevascik.org. This entry was posted in HST 122, Teaching and tagged David Armitage, Metternich. Bookmark the permalink.